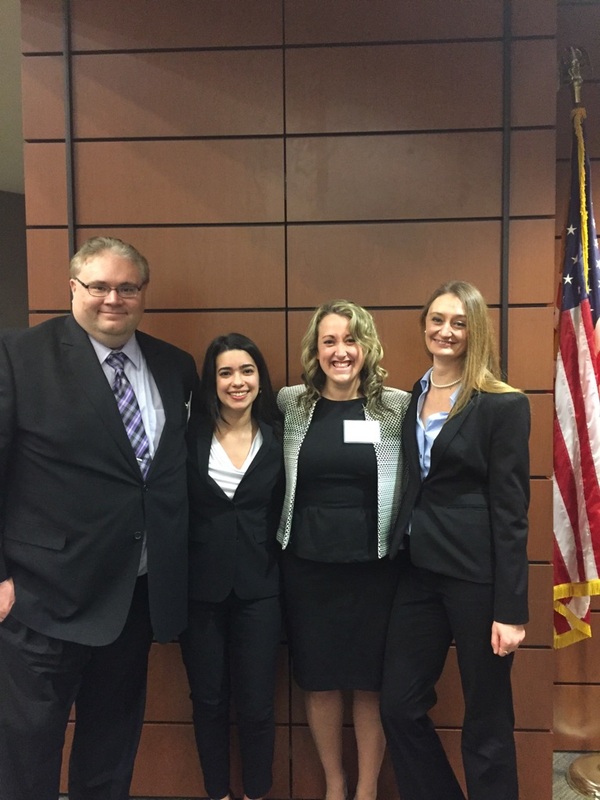 Congratulations to Celeste Borjas, Alyssa Gemein, James Wold, and Dena Welden for their strong effort in the 2017 Philip C. Jessup International Moot Court Midwest Regionals in Chicago last weekend. This year’s Jessup problem involved international law issues related to transboundary water aquifers, cultural heritage and migrant/refugee rights. Our Marquette team won the 2d place award for Best Memorial in the Midwest Region. Big congratulations! Attorneys and Marquette Law alumni Juan Amado (Jessup, 2011), Rene Jovel (Jessup, 2014) and Drew Walgreen (MU moot court, 2013), as well as Professors Megan A. O’Brien and Ryan Scoville served as team advisors. 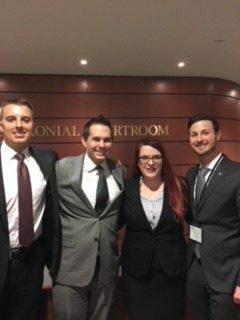 Special thanks to Jared Widseth (Jessup 2014) and Margaret Krei (Jessup 2013) as well as Attorney Nathan Kirschner for giving so much of their time to judge practice rounds this year. 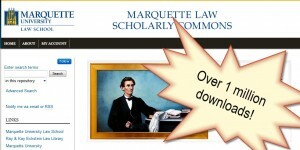 The law school’s repository, Marquette Law Scholarly Commons, was formally announced on the Faculty Blog on August 8, 2012. Less than a year later, Marquette Law Scholarly Commons celebrates its 1,000,000th download! Researchers from all over the world have downloaded articles from the repository. The following twenty countries have the highest download count (from most downloads to least): United States, United Kingdom, India, Canada, Italy, Philippines, Australia, Malaysia, Tanzania, Ghana, Singapore, Pakistan, Colombia, South Africa, Hong Kong, Nigeria, Russian Federation, Kenya, Poland, and France. The one millionth article downloaded was Freedom of Contract and Fundamental Fairness for Individual Parties: The Tug of War Continues, by Professor Carolyn Edwards. Professor Edwards has been a member of the law faculty since 1974. She was a Woodrow Wilson Fellow in philosophy at the University of California – Berkeley and is a member of Phi Beta Kappa. She is a graduate of the University of Toledo College of Law. Professor Edwards teaches contracts, sales, secured transactions, and negotiable instruments. Please join us in celebrating this milestone by visiting the Marquette Law Scholarly Commons and browsing our collections. What’s new in the legal research classroom? As was mentioned in previous posts, there is a new database, Fastcase, available to all Wisconsin bar members. In the Advanced Legal Research classrooms this past semester students were introduced to Fastcase. Now that it is available to all members of the Wisconsin bar, we plan to expand training on this cost-effective legal research tool. 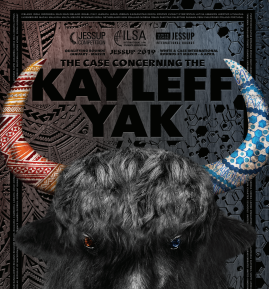 The Fastcase database has already been reviewed by Leslie Behroozi and Elana Olson in a joint post. I’d like to focus my comments on the Interactive Timeline feature of Fastcase. This new feature will prove useful for spotting trends in the law, not only to practicing lawyers, but also to academics, including those interested in writing papers for publication.